We honored again Linda and Carol for their amazing contributions to every aspect of DSC and for the first time we honored Coach Steve who drives down from Sacramento every Tuesday to provide excellent coaching for Tuesday morning athletes. While we honored these three individuals, we also honored every person there to help us celebrate - each person in attendance gives of his/her time in some way to DSC! Please enjoy Bob's re-write of "Little Deuce Coup" (Beach Boys) and photos from this wonderful event. The pot-luck meal proved that we have good luck - the meal was delicious and the friendship and camaraderie flowed! DSC volunteers extraordinaire Linda Acton and Carol Coddington met when Linda began rowing in 2010. 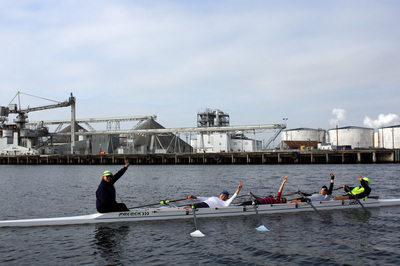 They quickly became friends and continue to enjoy sculling the Delta waterways together. DSC would be hard pressed to keep the bay doors open without this dynamic duo. They are shining examples of how to live well during retirement. Carol retired in 2010 after a career as a dental hygienist. Her rowing career started in 1991when she was introduced to sculling in a double. She remembers being Masters’ coordinator for Stockton Rowing Club when all communication was handled by telephone. Carol has a special place in her heart for the DSC Adaptive Program since she found herself unable to walk, talk, or write after a bicycle accident in 1985. She knows what it is like to be isolated as a result of her injuries and personally relates to the tremendous impact DSC has on the physical and emotional health of the athletes. In fact, Carol exclaims that her “… heart went ping, ping, ping…” when DSC Founder Pat Tirone asked her to help with the Adaptive Program. In 2008, Linda retired from a career as a Project Manager with Pacific Bell. 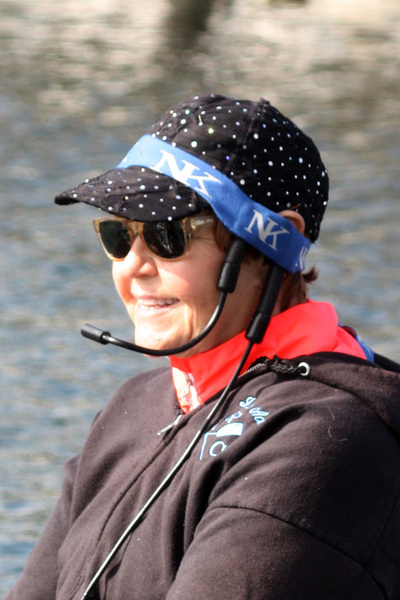 She became hooked on sculling when she took lessons from Pat in 2013. Linda was thrilled when Pat asked her to be one of the first DSC volunteers. 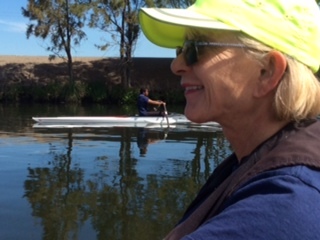 Pat had done so much to enhance Linda’s love of sculling and she wanted to give back. Linda explains that seeing the smile on athlete Lynette’s face during workouts is all it takes to keep her coming back to the DSC boathouse. Carol and Linda share a commitment to help whenever and wherever they are needed. Examples of their volunteer duties include working as assistant coaches on the water and the erg, driving the safety launch, helping the athletes transfer into the boats, rowing bow seat in a double with the adaptive athletes, and cleaning the boathouse. Linda’s project management background is a great asset as she tracks volunteer reporting of hours worked and other documentation. 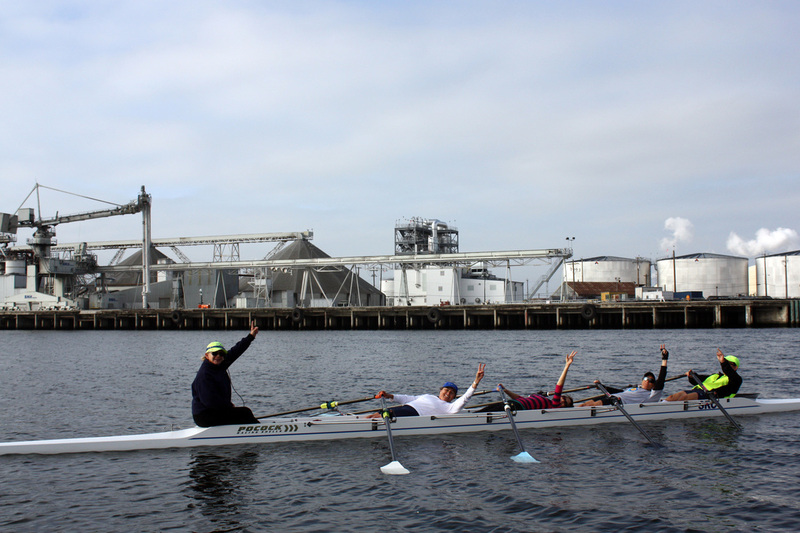 Delta Sculling Center would like to extend its deepest gratitude to “Team Carol and Linda” for their dedication to its mission of providing sculling programs for everyBODY. A DSC "FIX - TURE"
For a man who started off a conversation about Delta Sculling Center (DSC) with the statement, “… I don’t like water. I don’t even like to drink it….” Dave Morelli has had a dramatic impact on an organization that is dedicated to a water sport. All DSC founder Pat Tirone has to do is start a sentence with, “We could really use ….” and Dave miraculously has an idea of how to fix/build the item before Pat completes her thought. What seems miraculous to an ordinary person is commonplace to Dave. After 36 years of teaching shop at Franklin and Edison High Schools, he is sharing his knowledge and skills as a volunteer with several local organizations. Fortunately for DSC, his wife Karen sculls with Stockton Rowing Club and under Pat’s tutelage. As Dave explains it, Karen volunteered him when Pat realized that she had the need for a “fix-it” expert. Dave completed the building of transitional steps for an athlete with limited trunk control to use to transfer from a wheelchair down to a boat. He cleverly painted on its side “Getting Down to Sculling”. He created a feathering block that can be slid into oarlocks to keep the blade of a sculler with limited hand function on the square (instead of feathering). He reinforced the sliding seats used in the “oarmasters” of Alden boats to accommodate heavier athletes. He figured out how to attach a fixed seat (for athletes who cannot use their legs to row) to the tracks of the Alden oarmaster. Dave says that one of his next projects is to invent a way to cool and mist athletes on an erg during the hot Stockton summers. We’re hoping he’ll capture all the energy produced by the erg fan so we can convert it into some other energy and sell it on the open market! When asked what drew him to volunteer with DSC, Dave replied, “If I can, I want to help. My God-given talent is to do this. 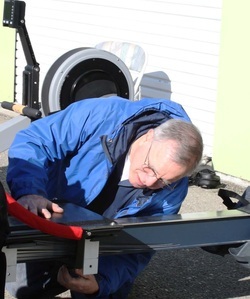 If it fits into my schedule, I find a way to do it.” Delta Sculling Center would like to extend its deepest gratitude to Dave for his dedication to its mission of providing sculling programs for everybody.